In 1955 there was an English instructor at the University of Buffalo. He had a wonderful wife, Elise Pickhardt Wilson who was as instrumental in this, what I consider, his most famous novel, “The Man In The Gray Flannel Suit,” (in fact, it is she that suggested this as the title.) This professor was Sloan Wilson, a Harvard graduate, and the author of this fantastic novel, that this Marshall University graduate was able to snag at his local library for a paltry twenty-five coppers. It will never cease to amaze me what joy a quarter can still purchase, if you know where to spend it! 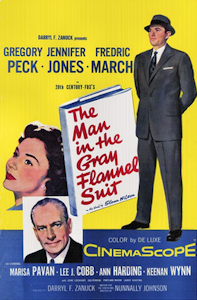 “The Man In The Grey Flannel Suit,” published by Simon & Schuster in 1955, is easily one of the greatest books I have ever read! I can see why this 304 page novel, was even made into a motion picture starring Gregory Peck and Jennifer Jones. Incidentally, DeForest Kelly, ( the actor who played Doctor McCoy, “Bones,” in the original “Star Trek” series had a bit part as an army medic. I haven’t seen the film, but I can say that the book has been exceptional! It’s the story of a life, the life of Tom and Betsy Rath, a couple, raising their children, and are struggling to find their place in a post World War II suburbia New York. It is a true picture of life in the 40’s and 50’s, as seen through the eyes of real people, with real concerns about their future. Tom and Betsy are struggling to somehow find that place of contentment, in their lives and family. Tom, a former WWII paratrooper, with his share of war secrets, lives in discontent, wanting a better life for his family financially, and Betsy is the faithful and dutiful wife, that is raising their three children. It is a book about being honest with oneself and others in life. It was a true inspirational read for me, as I found so many times through out this literary journey, so kin to what the Raths were going through. I want better for my family. I want to have the guts to be honest. I want to try to see this world not through these dark glasses of pessimism, but with a hope that all will be right with our world. It is a book about faith. Faith in one’s ability to climb out of the hole of despair, to find the diamond chips in the dust of darkness that often accompanies many of the twists and turns in this life. I learned something from this book, “The Man In The Gray Flannel Suit.” I learned that any situation can be turned around, and that patience is a necessary ingredient for success. Also, in this novel, there are many very interesting contrasts between the characters, but in each one you will find someone that is currently in your life as well. This is an incredibly well written novel. In fact in one of the other reviews I looked at, (yes I like to see what the other folks are saying,) the reviewer on Amazon, said that they had purchased it because they had heard that it was one of the best books ever written in English, and they were not disappointed with it. I do have to agree, and I sure have not been disappointed either! I thought much about this Psalm as I read this book. It has helped me to realize that no situation is so dire that some good cannot come of it, and trusting in Christ will lead to a right resolution of any circumstance. 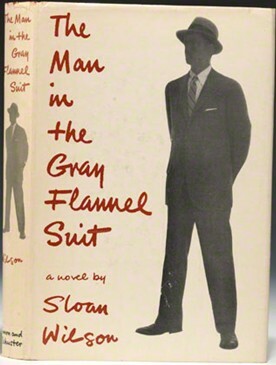 Make sure you read, “The Man In The Gray Flannel Suit,” someday in your lifetime. You will be the better for it. This entry was posted in fiction and tagged Courage, Psalm 138:8. Robert Browning's Pippas. Bookmark the permalink.